Heat Belgian or regular waffle maker according to manufacturer's directions. Separate dough into 8 biscuits; press or roll each into 4-inch round. Depending on size of waffle maker, place 2 to 4 biscuit rounds at a time in hot waffle maker. Bake 2 minutes or until golden brown. Cool 1 to 2 minutes. Spread peanut butter evenly on 4 of the hot waffles; spread jelly on remaining 4 waffles. 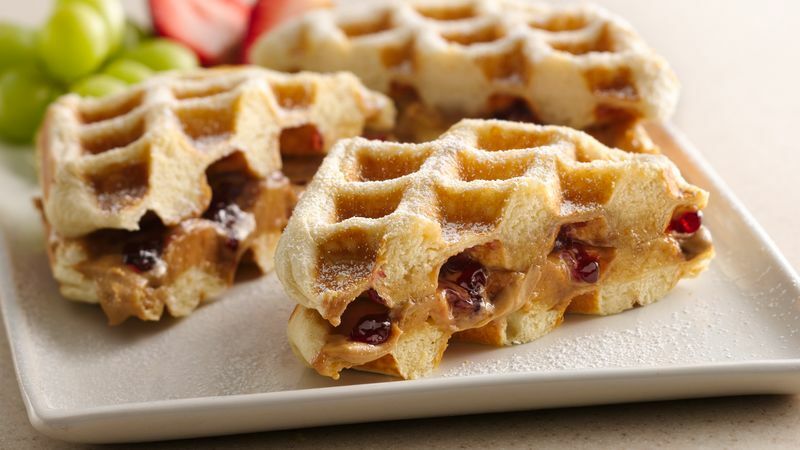 Place jelly-spread waffles, jelly down, on peanut butter-spread waffles. Cut sandwiches in half; place on individual plates. Sprinkle with powdered sugar; garnish with fruit.